Our foraging classes and herbal medicine courses give you the knowledge and skills to gather wild plants safely and sustainably. When you’re out on a hike, you’ll be able to gather tasty treats for your supper. Additionally, you’ll know how to harvest herbs to support vibrant health. You can unravel your dependence on grocery stores and pharmaceutical companies. Learning to forage for food and medicine empowers you to care for your own body, in deep connection with the natural world. Foraging classes reveal the richness of the wilds. Herbal medicine courses teach you the ancient healing wisdom of the plants. Foraging classes help you discover delicacies growing right outside your door! Plants are fascinating and full of richness. We love sharing our wisdom and exploring wild places. As soon as springtime warms up, you’ll find us gathering and nibbling tasty plants every moment that we’re outdoors. You see, foraging for wild foods is super satisfying, not to mention delicious. It’s taken us many years to get to know the wide array of edible plants in North Carolina that grow here in Southern Appalachia. We’re delighted to share that experience with you. With this knowledge, you, too, can enjoy the flavors of the wild. 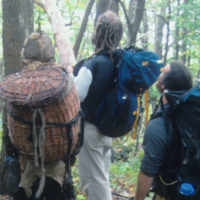 Every year in the early spring, we continue a tradition that is more than a decade old: We hit the trail for our Wild Foods Hike. 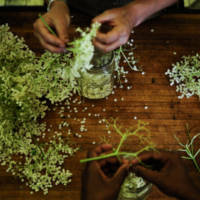 It’s a very hands-on foraging class; come join us this year! Throughout the growing season, we weave wild foods harvesting and cookery into our Immersive Permaculture Design Certificate Course. During this nine-month program (one weekend per month), we share our knowledge of wild plants with students through the seasons. In addition, we teach about the roles of the wild edges of our homesteads. When we know how to identify and work with edible weeds, they’re not such a bother in the garden! Observing the nature of wild plants can help us plan our gardens in harmony with nature. Foraging classes let us see the patterns in nature that build the foundation of permaculture. 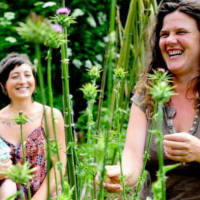 Herbal medicine courses empower you to heal yourself and your community. The healthcare system in this country is failing, but we can take our health into our own hands. Participating in an herbal medicine course gives you the power to make and use your own natural medicine. Herbs are fantastic for both preventative health and for treating disease and imbalances. Our wildcrafting class teaches how to make lots of common herbal preparations, so you can fill your medicine chest. It also covers cultivation and harvesting of many common medicinal herbs that are accessible to everyone. Carrying the healing wisdom of plants has traditionally been a role held by women. As we explore rewilding for women, we incorporate medicine making and herbal healing. This is an herbal medicine course that goes beyond the how and what of using herbs. It connects with the deeper aspects of the human relationship with plants. What better place to learn about plants than the lush, temperate rainforest near Asheville, NC? There are lots of reasons people come to visit Asheville. Our home is one of the most naturally beautiful and biodiverse regions in the temperate world. 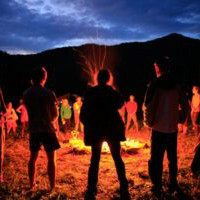 If you’re looking for foraging classes, hardly anywhere could be better. You’ll find tasty treats in the wilds here nearly year-round, including choice edible mushrooms like morels. If you’re interested in herbal medicine courses, this area is not only a hotbed of medicinal plants (some rare or endemic), but also a gathering place for herbalists. Our instructors truly love plants and share their knowledge freely in a clear, inspiring, funny and engaging manner. We look forward to exploring the green world with you!